Loving Your Household Chores Enough? 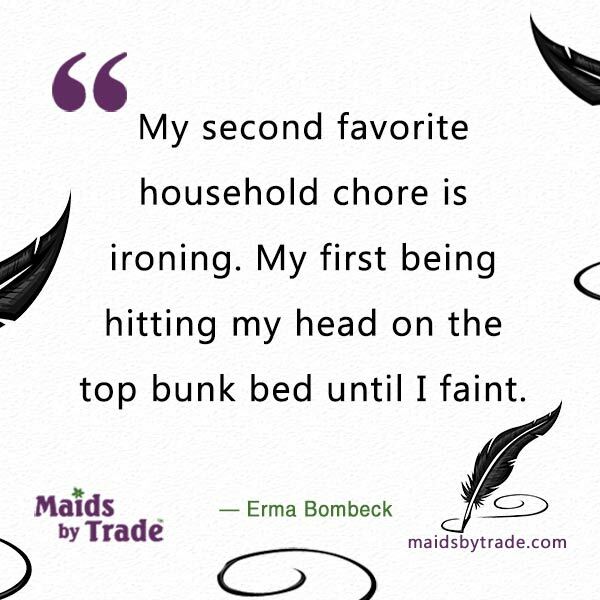 Maids By Trade » Savvy Humor » Loving Your Household Chores Enough? Erma voiced a thought we have all had. Is there anyone that actually enjoys house cleaning? Erma was from a time when the women were expected to do all of the household chores with a smile on their face. Well not today ladies…we don’t have to anymore! Actually, no one has to clean their own homes. That is what a maid service is for! Don’t whack your head on the bunk bed Erma! Just pick up the phone and call Maids by Trade. Not only will you get a clean home, you’ll avoid the painful bump on your head too. “My second favorite household chore is ironing. My first being hitting my head on the top bunk bed until I faint.” — Erma Bombeck.